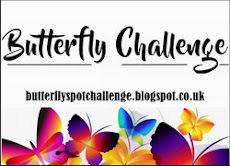 Butterfly Challenge: #119 Spin The Butterfly Wheel with C for Centre Step. #119 Spin The Butterfly Wheel with C for Centre Step. We are now onto the 3rd letter of the alphabet which is C. I am so pleased to see how many of you are coming to play with the new format. Thankyou. 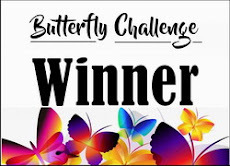 Winners results for #118 are published in the post below. Make sure you check back as it could be you. Can I please ask that Winners do acknowledge their prize in the comments on the Winners post as well as emailing their details to me. This way I will know to expect an email. Please state if you are only playing for fun so that it gives someone else the chance to win. Challenge is for 2 weeks. Your 6 elements are Cerise/Cadet Blue/Champagne/Circles/Candi + your Butterfly. Check out the Card shapes Tab above to see how to make. Yes, this looks like fun! Love, love, love your cards, Mrs. A! Beautiful centre step cards! I think my fave is #2 - love the colours of your gorgeous paper and you've used such pretty die-cuts! Thank you for inspiring! Fabulous inspirations!!! Love especially the last one! 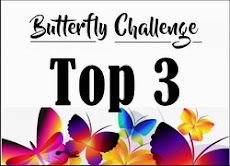 Your Butterfly cards are lovely and you really know how to rock a challenge. Butterflies are the Bearers of 10,000 Happinesses. Beautiful creations Mrs A, lovely colors and designs! 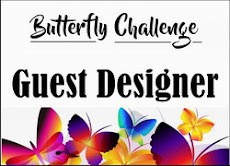 another really super challenge that gets our creative minds working. As always your tutorials are excellent, and your designs are so inspirational too. Love trying to include all 7 elements is quite a challenge, and good fun as well. Lovely cards, Mrs. A. I esp love the colors and design of #2. As usual, I am bringing up the rear with the last card in (or close to it!). I used a lovely die I won from you in my card and I see it is part of the prize for category #2 which my card falls in. If you wish, you can put my name in the hat for the lower prize....not sure if you do that or not. Thank you for another lovely challenge. Winners #118 and New challenge.